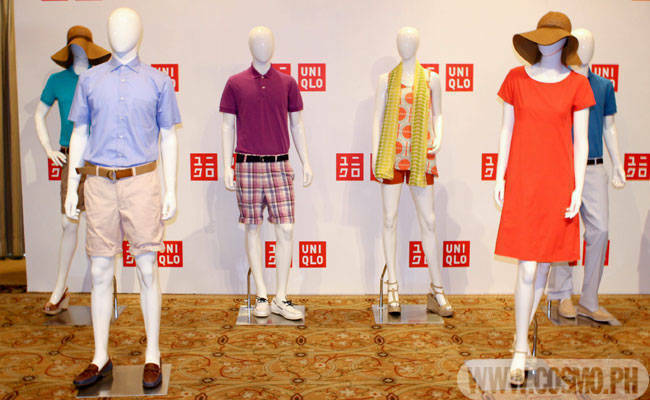 Take A Sneak Peek At Uniqlo Clothing--Opening In Manila Soon! We give you a preview of the hip pieces you can nab when the popular Japanese apparel brand opens its first store in the Philippines in June. The rumor that fashionistas have been buzzing about since last year is true: Uniqlo is coming to Manila! In June 2012, you'll see for yourself why the Japanese brand is the largest clothing retailer in Asia. After recently opening stores in Thailand, Malaysia, and Singapore, Uniqlo is set to open its first Philippine branch at the SM Mall of Asia. But, you don't have to wait for months to get a glimpse of the chic casual clothing you can nab when they open here; you can preview their latest collection right now! Cosmo.ph attended the Uniqlo media preview recently, and we saw the newest T-shirts, dresses, trousers, innerwear, and outerwear that will be available at their store a few months from now. According to their brand philosophy, clothing is "component wear," meant to be mixed and matched according to your personal style. This is apparent in the simple designs and classic silhouettes of the current collection, which can be seamlessly incorporated into your own wardrobe. Launch the gallery to view their Spring/Summer 2012 Women's Collection, as well as all the pieces that were on display at the press preview. For more information, check out their official website and Facebook page.